Eden Gardens is one of the best and famous cricket ground in India. Eden Garden is located in Kolkata in India. Eden garden is one of the biggest cricket stadium in the world that can hold about 90,000 people at a time. This beautiful stadium was opened in 1864 which is one of the oldest cricket stadiums in the world. Eden Garden is also famous for second largest cricket stadium in the world after Melbourne Cricket Ground in Australia. Eden Gardens is the home ground of Indian cricket team, Bengal cricket team and Kolkata knight riders. The owner of Eden gardens is Bengal cricket association. Eden GArdens include a club house which was named as B.C Roy club house for the honor of West bengal Chief minister Dr. B.C Roy. 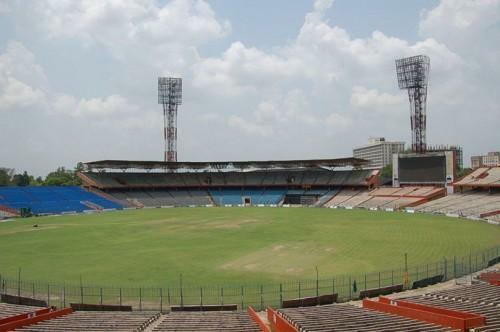 The first International test match in Eden Gardens was held in 1934 and played between India and England. First One day match in Eden Gardens was played between India and PAkistan in 1987. The first IPL match in Eden Gardens was played in April 2008 between Deccan Chargers and Kolkata Knight riders. The most sucessfull team in test and ODI of Eden Gardens is India with 9 wins in each. 1) 1987 World cup final played between Australia and England where Australia defeated England by 7 runs. 2) In 1991 Kapil Dev took a ODI Hatric against Srilanka in Eden Gardens. 3) In 2000 Harbhajan Singh became the first Indian to take a hatric in test cricket against Australia. 4) Most number of runs scored in Eden Gardens is VVS Laxman with 1041 runs. 5) Most number of wickets taken in Eden Gardens is Harbhajan singh with 46 wickets.